The incredible Mad Maxine Waters just doesn’t know when to shut her nasty hole. Nor does she seem to have even the basest understanding of her own jabbering, hooting, and hollering. 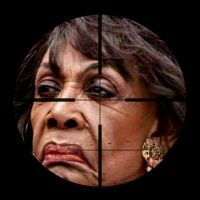 Then, this is Mad Maxine we’re talking about. She has a long and sordid history of unacceptable, uncivilized, and violent public behavior and only a passing understanding of truth. Ole’ Mad Maxine has also cancelled some of her speaking engagements because of alleged death threats, which is incredible… in the old, true sense of the word, i.e., not credible or believable. No, it’s very highly doubtful that there were any objectively credible threats made against Waters’ life. Much more likely is that this is just the jabbering of an aging Black attention whore whose delusions create or magnify threats to ridiculous levels. That is, of course, giving Mad Maxine the unearned privilege of believing that she actually believes whatever threats were made were credible and that this isn’t just more of her rabble-rousing and stoking the fires of civil unrest and insurrection. As both a Democrat and a Blacktivist, hypocrisy is to be expected from Waters. However, like most things involving this creature, Max Maxine dives deeper in the cesspit than most and then wallows in it. She has actually complained that she’s being harassed because Americans are calling her office and sending her official email account to voice their displeasure with her actions. This, after she openly and explicitly called for members of President Trumps administration to be terrorized and tacitly called for violence against them and their families. And, in a surprising turn of events, Water’s issued a bit of bravado and defiance to her alleged – read as incredible and/or fantastic – would-be executioners, “If you shoot me, you better shoot straight. There’s nothing like a wounded animal.” Yes, that’s right! A 79 year-old Black defiantly described herself as an animal. That, my fellow Americans, takes a lack of self-awareness and awareness of the “long and sordid” history of race relations in America that is surprising and truly incredible. But of course, this is Mad Maxine Waters, who is in a political knife fight with Nancy Pelosi to be the face of the Democrat party in 2018 and beyond. And, frankly, Waters’ direct calls to persecute and terrorize Republicans and her more violent pathology – 3rd stage syphilis? – does sit better with much of that party’s constituencies than Nancy’s more dementia praecox-related insanity. This entry was posted on Thursday, July 5th, 2018 at 6:31 am and is filed under Politics. You can leave a response, or trackback from your own site. It is counter intuitive, but I can only hope Rep. Waters continues on her current path. Yes she is stirring up the crazies, which is dangerous, but she is preaching to an ever shrinking choir. Politically she is not convincing new people to come to the Democratic fold. The last thing anyone would want to do is hurt or threaten her. I almost think that she is hoping to become a Martyr. She is a one woman wrecking crew that is hurting the Democrats. Whenever anyone on the right needs to change the subject, we always have Maxine to fill the bill.